wellness | Elite Training LLC. Is eating breakfast really the most important meal you can have each day? The American Journal of Clinical Nutrition indicated that individuals that ate breakfast more easily maintain their weight. Of course healthy breakfast options are more likely to help with weight loss, but the results are in… breakfast is essential. 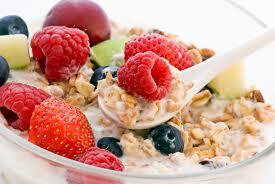 So, before you run out the door, grab a yogurt, some fruit or low sugar granola bar. To help with your addition of breakfast, add oats to the menu. Plain rolled oats will help fill you up more than the add hot water and mix versions. Those contain a lot of un-necessary sugars. Throughout the winter I was eating oatmeal very often and particularly loved it with diced Granny Smith Apples and a little cinnamon and sugar (just a little) sprinkled on top. My wife likes cranberries amd almond slices with a little low-fat milk… just a few suggestions. How about eggs? They provide much needed protein and help to sustain you through the day. When I have a big day, I try to start it with that protein boost. I know taking that time to cook is not ideal, but I microwave my eggs to save time and clean up. 2 eggs scrambled in a coffee mug, 40 seconds, mix, another 20 seconds, mix, maybe another 20 seconds mix and go. Fits in my cup holder and I eat at red lights on my drive in. Gets my breakfast in and helps me feel good for my morning clients. So, breakfast is the most important meal. Make good food choices and carry them throughout your day. I really enjoy this juice. It is so very delicious and is a good mix of fruits and veggies to fill you up and really taste good at the same time. As always, depending on the juice-making ability of the ingredients, add more. 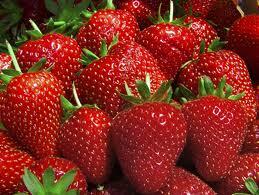 Personally, the strawberries add a nice texture to the juice and a great flavor. Enjoy and would love to hear your feedback after you try it.